Quran: How to conduct civil dialogue – dedicated to Ambassador Sam Brownback and Pastor Bob Roberts. I am pleased to dedicate this write up to two individuals – Pastor Bob Roberts and Ambassador-at-large Sam Brownback for their bold take on respecting the otherness of others. Both of them could not be more clear – they said, they love Jesus, and they are Evangelical/Conservative Christians respectively, but when it comes to other humans, they will stand up for the freedom of all humans without any reserve. I salute you two, you two will change how conservatives are viewed in the world. Thank you. Civil Dialogue is based on respecting the otherness of other. You are who you are and I am who I am, neither one of us is more privileged than the other, nor do we have a stamp of approval from God to give us an automatic advantage over the other. The purpose of a dialogue is to understand each other’s point of view to find solutions to a given conflict, without getting angry, digging in our heels or denigrating the other. As a pluralist, i.e., one who respects the otherness of other, I access the pearls of wisdom from all faiths and traditions. Indeed, I have written over 250 articles in Dallas Morning News, and all the articles weave through at least five religions in a given article. Thanks to Huffington Post for publishing nearly 200 articles, in all there are over 3500 articles published. There are a few guiding principles to carry a civil dialogue and I am pleased to highlight the guidance from Quran, Prophet Muhammad’s example and Rabbi Gordis in this essay. Whether we are conducting a dialogue at the workplace, place of worship, school, playground, government and other places, we all have to be conscious of other person’s point of view, is it valid to him or her and we should give full value even if we don’t agree. The purpose of a dialogue is to find ways to understand each other and work towards a better environment for everyone one. A good example of wrecking the relationship happens in Democratic and Republican conventions. I was at the C-PAC meeting in 2017 and for three days, all I heard was attacks on Democrats – I talked with Matt Schlapp, the Chairman of the conservative Union to ask the speakers to take the attacks out and focus on content of the message, and that will cause Democrats to understand some of the conservative values and may even support some. These meetings are designed to bash the other rather than conveying their message to the other and it won’t work. Bashing takes you nowhere. Both sides need to respect the otherness of others. Rabbi Gordis continues, “It is for each religious (social, political or other) community, or those from each community who choose to participate in inter-religious conversation, to determine the terms under which he or she enters that conversation, the goals of the conversation and expectations from the process. The true conversation may uncover areas of convergence but is most important in helping to understand areas of divergence. The question for participants is: Is that divergence threatening or problematical, or can it be a source of enlightenment and enrichment by broadening the perspectives and insights on the experience of being human that one gain from one’s own religious tradition. Prophet Muhammad (PBUH) exemplifies the idea of “respecting the otherness of others.” When the people of Quraish and Muhammad agreed to the terms of Hudaibiyah peace treaty in Mecca, the Quraish leader refused to sign the treaty, he said he did not like the name in the signature line which read, “Muhammad, the prophet of God.” Before Prophet’s associates got angry for such pettiness, but the Prophet asked them to think and said, look he does not believe that I am the prophet of God, he knows me as the son of Abdullah, let’s change the name so we can move forward with the peace treaty. His associates protested and insisted that he accepts the Prophet as the Prophet of God. That’s when Muhammad explained to them again to respect the otherness of other. I believe it will go down as the greatest example of pluralism in the annals of history. One of the chapters in Quran should be the textbook material for all students of Pluralism (i.e., respecting the otherness of other). This chapter is called “Kafirun” meaning those who do not believe in what you believe. It is 109th chapter and has 6 verses. This chapter addresses the believers (of other faiths) in the most dignified way, putting everyone on par without denigrating any. It is an exceptional example of civil conduct for one to follow. Nowhere in this chapter is a claim made that the faith of Muslims is superior to others. This chapter is about consciously nurturing civility in societies. It is not about overlooking the differences and focusing on commonalities, it is simply about accepting the otherness of other. You are who you are and I am who I am and let’s figure out how we can co-exist with least tensions. This is the basis of pluralism – i.e., respecting the otherness of others. All religions are beautiful and none is graded to be superior or inferior. I may not believe what others believe, as others may not believe what I believe. I will accept them for who they are, as they would accept me for who I am. I will not disrespect any faith, as it amounts to arrogance, and God simply does not like anyone who is arrogant, indeed, arrogance is the root cause of all conflicts and humility builds bridges. Arrogance kills the very spirit of society – Justice, peace and equality. Islam is about live and let live. Learning to accept and respect others’ right to exist and figure out the best way to co-exist. A majority of Muslims get this right, and few don’t, indeed that is the case with people in every religion. As the saying goes “beauty is in the eyes of the beholder”, I would add “faith is in the heart of the believer”. As a person of faith, yours and my role is to mitigate the conflicts and nurture goodwill among peoples and nations. That brings peace, and that is the other word for Islam. In another chapter, God essentially says, I have created ya’ll from a single couple, and made you into many tribes, communities, and nations. Each one of you is different and unique with your own thumbprint, DNA, taste bud and behavior bud. He also said, had I willed, I would have punched you all out from a factory template to exact specifications, all males to be precisely same height, weight, color and same with the females. But I chose to make you unique and gave you complete free will to create harmony and cohesiveness within and with what surrounds you. Then he concludes, the best one among is you is the one who learns about each other. Knowledge leads to understanding and understanding to acceptance and appreciation of the other resulting in harmony and peace. 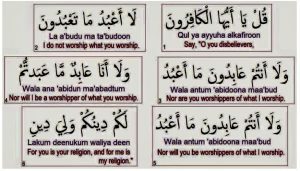 The following chapter in Qur’an does not say, that others’ belief is inferior, in fact, it says, as your belief is dear to you, as my belief is dear to me. So much respect is given to the other faith.